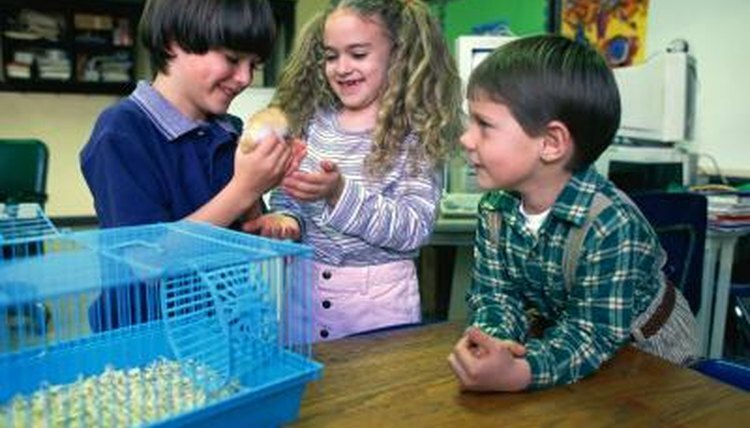 Hamsters are very popular "pocket pets" primarily because of their small size and relatively low care and maintenance. Before you bring your pet hamster home you will need to provide her with the right cage. Pet stores have a wide variety of cage choices available, but most owners settle on either a wire cage or a glass aquarium cage. There are pros and cons to both. When choosing a cage, first take into consideration your pet hamster's needs. Hamsters like to burrow and nest, so the cage floor should be deep enough to allow for a generous spread of bedding for burrowing. Your pet hamster will also prefer separate corners of her cage for eating and storing her food, and for using the bathroom. Hamsters are curious creatures and like to explore. Whether you choose a glass cage or a wire cage, make sure there is enough space in the cage for your hamster to explore and play. When it comes to her cage, bigger is better! Many hamsters are kept in glass tanks with a secure wire mesh top. A glass tank may better protect your hamster from other pets and small children. Glass tanks also allow for clear viewing of your pet's antics. Keeping your hamster in a glass tank may cut down on cage odors; however, this could come at a price. Glass tanks are poorly ventilated. Ammonia may build up and lead to respiratory illness. Glass tanks can heat up quickly and cause your hamster distress.The tank should always be kept in a well-ventilated but draft-free location. If you do keep your hamster in a tank, regular weekly cleaning is a must. Tanks are quite heavy, though, and can break, so be careful. There are many benefits to a wire cage. Wire allows for good ventilation and may keep moisture from building up too quickly in the bedding. If you do go with wire, make sure there is a half inch or less of space between the bars, so your hamster can't squeeze out. Narrow bars will also keep kids from poking their fingers into her cage, and other pets from poking noses or claws through the bars. Wire cages are also easier to clean than tanks. Many wire cages have a detachable tray bottom which can be snapped off. Dump the litter, wash, sanitize and dry, and it's ready to be filled with bedding again. Mess may be more of a problem with a wire cage. Your hamster may kick the bedding up and it may scatter outside the cage. A wire cage also lets in more drafts, so make sure her cage is located in a draft-free room. If you are still having trouble deciding between housing your hamster in a tank or a wire cage, consider a combination of both. Some hamster owners use a special tank topper for the glass tank. The bottom tank is filled with bedding for burrowing and nesting, and a wire cage attachment is fitted for the top. This allows the hamster to climb and explore in the well-ventilated wire cage. When she's ready for a nap she can go "downstairs" to the tank. Some owners find these combination cages difficult to clean. Choosing a tank or a wire cage for your hamster may depend on your home environment. If you have small children and other animals at home, you may prefer the safety of a glass tank. The Purdue College of Veterinary Medicine, however, recommends using a wire cage over a glass tank. A wire tank offers easier maintenance and a healthier living environment for your pet. Either way, hamsters are delicate creatures, so weekly cleaning and sanitizing is a must.